Widely regarded as the most ornate, extravagant bridge in Paris, Pont Alexandre III is an arch bridge spanning the Seine that connects the Champs-Élysées to les Invalides and the Eiffel Tower district. This picturesque bridge, built from 1896 to 1900, features exuberant Art Nouveau lamps and sculptures of cherubs and nymphs at either end. Be sure to look up toward the top of the massive columns to view four gilt-bronze statues of Pegasus held by Fames that watch over the bridge. You'll want to spend an adequate amount of time looking for the hidden images that are carved into the pillars and the arch of the bridge: water spirits, cupids, sea monsters, and more. 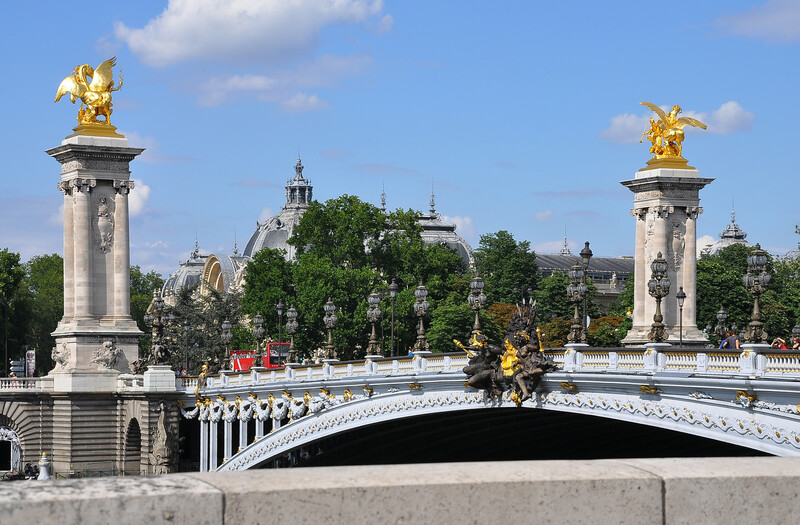 Our Paris online trip planner makes visiting Pont Alexandre III and other Paris attractions simple, and helps you make a travel plan personal to you. It is a very photogenic bridge in the bridge over the Seine river. The view from the bridge is wonderful. Great place for a romantic moments .. perfect place for taking pictures . Views are many and there a room for everyone there . Just wait for the sunset.. and start taking pictures after the light goes down . Then enjoy your memories .